What if I were to tell you you are scheduled to volunteer for 20+ hours over three days, plus training, and days that start at 7:30 and go until midnight? And you’d love it so much, you’d ask to take on more whenever the opportunity arose? Would you do it? What if I said it’s totally worthwhile, and you would want to do it year after year? Because it’s Social Media Marketing World (SMMW), the best, most organized conference I have ever been to. It’s the only 3-day event where volunteers work a lot and laugh even more. It’s also the only event where the staff and organizers are relaxed, smiling and laughing throughout the entire event. And by all accounts, it’s (mostly) not from exhaustion. When I first learned about SMMW, I was working in downtown San Diego in an office building that overlooked the harbor. During this time, the two monitors on my desk were working overtime. On one, I used for work, while on the other, I was Twitter-stalking the event that was happening just steps away. That happened every year until 2017, when I was able to finally attend as a volunteer. Needless to say, being a volunteer was a million times better than stalking everyone who was SO freaking close, and yet SOOOO far away. Despite some people’s first reaction to why I volunteer, “that must be really good for your business.” I didn’t sign up to volunteer at Social Media Marketing World to help my business. When I signed up the first time, I wanted to learn more about social media since I hadn’t been hands on for a few years, and I wanted to brush up my skills – and help others as I did so. I also wanted to help my students have access and the experience of volunteering. 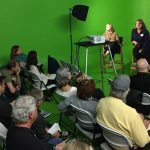 At the time, I was high off my experience of volunteering for the San Diego American Marketing Association’s big event, and I missed being around people who are passionate and excited about their work. It was a drug, and I wanted more. SMMW filled that need, and created one that was 100x bigger. It is the ultimate summer camp for social media marketers. This year I volunteered without missing a beat, I wouldn’t miss it for the world, and luckily they had me back. 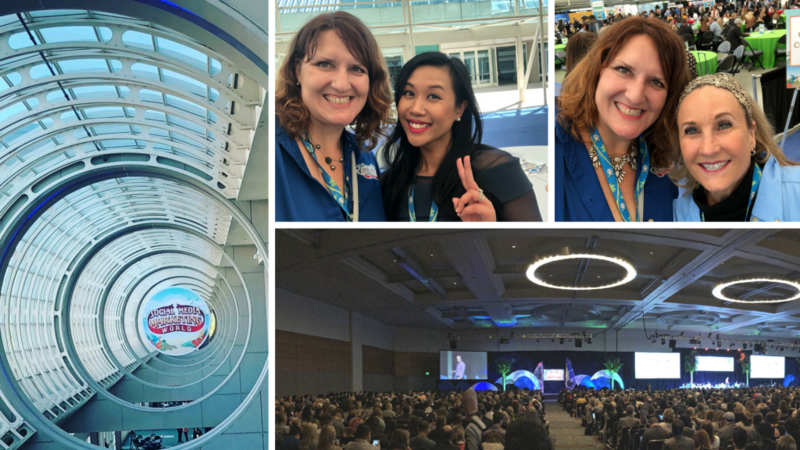 Here are nine reasons why I volunteer at Social Media Marketing World, for the American Marketing Association, and why I also spent five years launching and running a dance contest at my outrigger canoe club’s big race. And here’s a hint: it’s not because I have a lot of free time. 1. Finding and building my tribe. Let’s face it, when you do something you’re passionate about, you’re going to meet like-minded people. And that’s an incredible feeling. People who give up their time for free have a lot of passion and believe in what they’re doing. This passion and excitement is intoxicating. I love being around it and their energy fuels my own. The volunteers I’ve met in the past two years have also become part of my tribe, or I’ve become part of theirs. They are friends, mentors, sources of inspiration and laughter. It was an unexpected outcome and I am utterly thankful for it. 2. Making an impact. I love being a part of something bigger than me. When a group of people get together, they can host huge events, help others learn, provide access to information that people might not have had, they can clean up the environment, and help others find their tribe. Volunteering allows me to help attendees find their tribes and key contacts. It also provides an immediate impact on specific individuals. 3. Connecting. Working alone can be isolating for extroverts. Many people feel that way about attending big conferences alone. Being able to attend conferences like Social Media Marketing World – where there is a huge focus on networking and helping people make connections is so important. No one wants to feel awkward and alone. Being able to help others make connections and help support their personal and professional efforts is something I thrive on. As a Networking Ambassador, this was my role at SMMW for the past two years and I love every second of it. No one wants to feel alone in the middle of a crowd. If me saying a few words to them and helping them enter other conversations can make a difference, then I will happily do it all day long. 4. Magical Moments. I firmly believe in those magical, or serendipitous moments. Those times where you find yourself talking to someone and there are unexpected connections. They happened all day, every day at SMMW. The people making connections, finding people they know, similar passions, and more. 5. Volunteering forces me to be present. When I am looking for people to talk to, you have to be in the moment. It is impossible to make meaningful connections when you’re thinking ahead, or only paying partial attention. Volunteering gives me a break from everything else I have going on and allows me to focus on the people right in front of me. There’s a lot to be said for making people laugh, or seeing people find their own tribes. 6. Change someone’s day. People want to be seen. Amazing things can happen when you ask a few questions, when you take a few moments out of your day to listen and focus on them. 7. Stories. Let’s face it, I’m a sucker for a great story. Last year at SMMW17, I met an older (almost elderly) gentleman who turned out to fun an online karate program that had more than 2,000 videos in its library. Another man ran a luxury car rental company in Canada. Their stories of how they got started and what they’re doing today are inspiring. In 2018, I met a plumber who was amazed to find he was the only one in his industry attending. The speakers provide their amazing expertise, and for that, I’m grateful. However, I have found so much inspiration in the stories of the attendees I’ve met. Hearing how they started their business, to understanding their reasons for going to the conference. If I can point them in the right directions, and leave with a few good stories myself, then that’s even better! 8. Finding Ways to Raise the Bar. Volunteering gives you the chance to do things you normally wouldn’t do. When my friends told me I was launching a “novice dance contest” for my outrigger canoe team, I had no idea what to do with that. However, by getting others involved, we were able to make it a huge event over the years. At SMMW, my role includes walking up to strangers and starting conversations. It involves listening to their feedback and awe at the magnitude of the event. Being able to support an event that continues to raise the bar is a point of pride. It also inspires me to turn on the creativity to find ways I can raise the bar daily. 9. Perspective. Volunteering gives you the behind-the-scenes perspective of what it takes to put a big event on. You meet the people organizing the event and can see what they’re like day-to-day, not just from the outside. SMMW is the best run event I’ve ever attended, let alone been a part of. And the people who work at Social Media Examiner and who put on SMMW could not be a better group of people if they tried. Being able to see who they are, how they do things, and how things are run is truly inspiring. When I say I volunteer and people automatically respond that it must be good for my business, it minimizes all of the ways volunteering can impact you. Yes it takes time, yes it’s not always convenient or easy, but yes it is worth it. So whether you’re looking at volunteering for a few hours to clean a beach, or for almost a week at Social Media Marketing World, don’t hesitate, just go for it. The rewards are different for everyone, and they reach beyond what you think is possible, you just need to be open to them!